The characters in A Song of Ice and Fire certainly cover some ground. In this map all the named characters get a path and we can follow their progress (and often their untimely end) by following their lifelines. 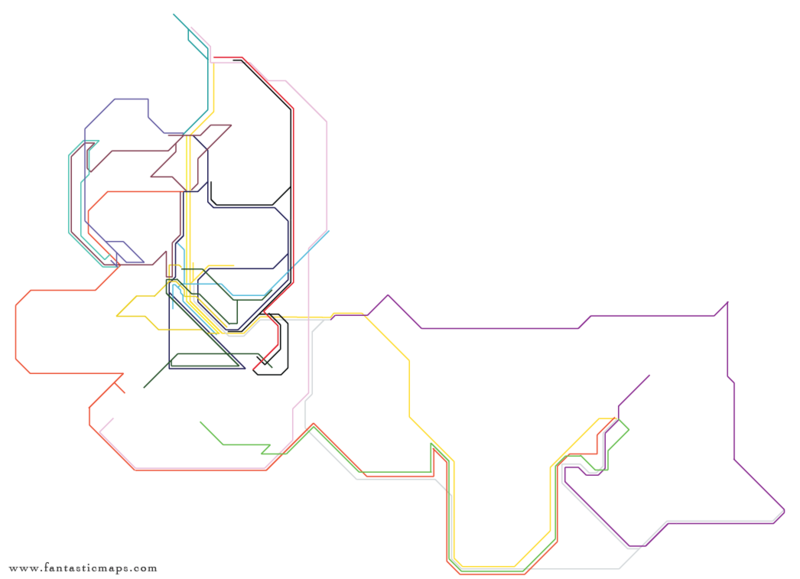 Each line has a colour that corresponds in most cases to their house. So the Starks are in shades of blue, the Lannisters get golden yellows, and Melisandre of course is a deep red. 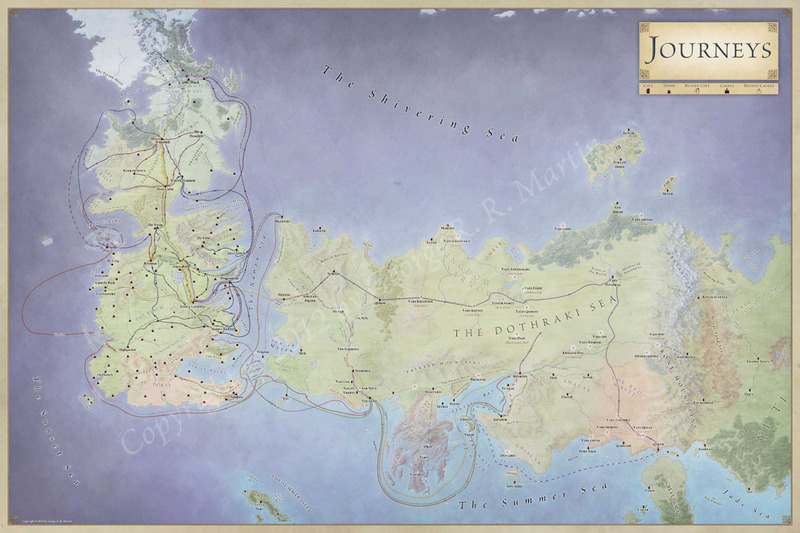 The paths in these maps were all researched and charted by Elio and Linda at Westeros.org. 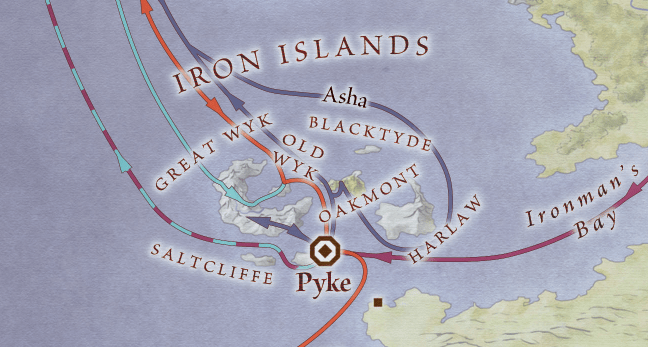 This map could not have been created without their thorough and painstaking work. If you’ve not read to the end of Dance with Dragons, don’t look too closely as this definitely contains spoilers. 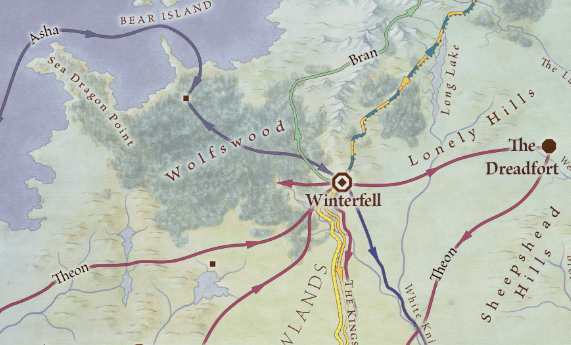 I cheated a little here, and the parade of characters from Winterfell to King’s Landing that begins the books is a single golden yellow. However once things go south in King’s Landing, the lines burst forth in a multicoloured web of intrigue. You can also see here that when two characters travel together they get a dashed line. Can you guess the colours heading over the Mountains of the Moon? There was some discussion about adding a legend to this map with each of the character colours. It was decided to drop it, as the colours themselves give the hint as to the character, and there are labels on the lines regularly to help you pull out which character you’re following. The background on this map was faded intentionally to make it a little easier to pull out the lifelines. 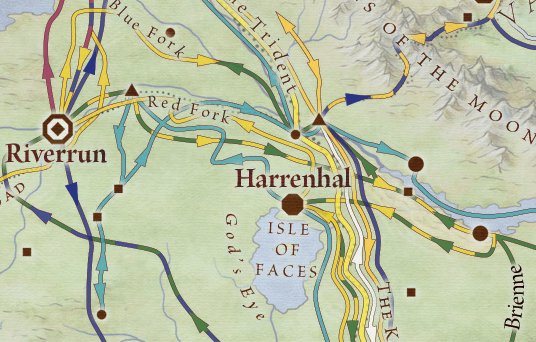 As with the other maps – you see the full resolution images in twelve 2 foot by 3 foot posters in the Lands of Ice and Fire map folio. The map is copyrighted, and Mr Martin holds the copyright. Now we all know what he does to characters he likes, so I don’t want to know what will happen to me 🙂 The maps in the the folio are huge – 24″ by 36″. They are more than large enough to see all the detail. I’m glad you like them, an dI hope you get a chance to see the full size maps close up. You should disable ligatures in text when the letters are letterspaced (e.g., Little Rhoyne, whith that font —possibly Brioso— has a ligature in the “tt” which looks awful). In any case, astonishing work! Really! They are beautiful. What I don’t like is that you do not provide high quality images; but if you did, they would instantly proliferate around the internet. So it’s a tricky solution. Still, I hope that at some moment I have the chance to look at the full resolution images. 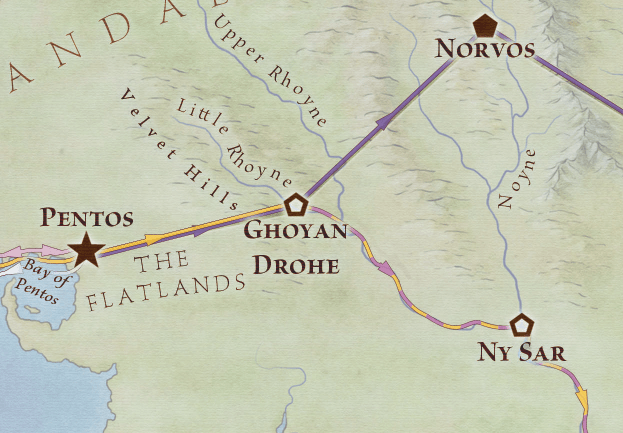 You could try to convince George to publish an open map (in vector format, may be similar to this http://www.ititches.com/middleearth/me.pdf) so it becomes THE reference map, rather than having tons of maps which are not perfect (nor that beautiful). Good call on the ligatures. That’s a fix that was needed.